June 29, 2006: Wayne Ogden alleges he was kidnapped by Jeremy Johnson when he went to pick up a $1 million check for a business investment. Ogden claims he was attacked and forcibly restrained until he agreed to sign over a trailer park to Johnson and his associates, who were upset because they'd lost $500,000 in Ogden's company. Dec. 13, 2006: Ogden complains about the kidnapping to the Washington County Attorney's office, which referred the investivation to the FBI because Ogden alleged law enforcement was involved. Early 2007: FBI begins investigating kidnapping allegation. April 9, 2007: FBI interviews Johnson, who admits that when he showed up to meet with Ogden, Ogden was restrained. Johnson claims Ogden was released and free to go at any time and that the trailer park was offered voluntarily as collateral. Johnson refuses to identify all those in attendance. Johnson said he knew who had hired one of the individuals who restrained Ogden but refused to tell the FBI. June 1, 2007: FBI turns report of investigation over to Santa Clara City Police, stating "At this time, logical investigation has determined that an unlawful detention of Mr. Ogden occurred." FBI bows out of investigation after it determined no law-enforcement officers were involved in the kidnapping as Ogden alleged. July 25, 2007: Santa Clara City Detective Mark Simpson takes over investigation from FBI, but struggles to make contact with Ogden. March 5, 2008: Simpson makes contact with Ogden, who had been incarcerated, and resumes the investigation. Nov. 5, 2008: At least four sources confirm to Simpson that Johnson spoke of restraining Ogden and not letting him go until he got his money back. Nov. 2008: An e-mail says that the Utah Attorney General's Office would not get involved in the case, since Johnson was a friend and campaign donor to then-Attorney General Mark Shurtleff. Dec. 6, 2008: Simpson finds multiple witnesses have retained lawyers and refuse to speak with him. Simpson sends case file to Washington County Attorney's Office. Due to conflicts of interest Johnson had with the county because of his donations, Washington County sends the file to Iron County. April 26, 2010: Iron County sends letter back to Washington County explaining it decided not to file charges based on the investigation, citing credibility concerns with Ogden, difficult witnesses and troubles that arose with Simpson struggling to gain assistance from Washington County. The No Filter Show is an irreverent video blog hosted by two goofballs who spotlight local businesses and events on the St. George News website (StGeorgeUtah.com). 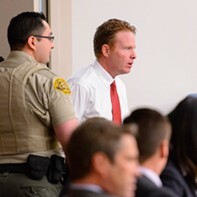 An editor's note below the Dec. 24, 2014, episode titled "Jeremy Johnson Rides the Short Bus," acknowledges the St. George businessman is facing multiple lawsuits from the federal government and that the site was not taking a position "in favor of or against Johnson's guilt or innocence." The hosts of the show, wearing Santa Claus hats, are filmed cruising around St. George in a short, yellow school bus. They drive up to a man standing beside the road—who, by coincidence, also is wearing a Santa hat. "This guy looks like he's down on his luck," the driver says as they pull over to discover that this sad traveler is, in fact, Jeremy Johnson. They don't mention why he might be down on his luck, and, unless the viewer knows about the Federal Trade Commission's civil suit alleging he defrauded hundreds of thousands of Americans out of more than $275 million, they can only wonder. According to a 2011 Department of Justice federal indictment, Johnson's Internet-marketing business, I Works, lured customers—many reeling from the 2008 recession—into signing up for a program to help them get government grants to establish businesses or pay for cell phones. Most customers would discover only too late that one of Johnson's more than 60 shell companies had ambushed their credit-card bills with hidden fees. Johnson is currently prohibited from speaking to the media about the pending FTC charges after a judge placed a gag order on him in May 2013. On the short bus, at least, Johnson was given a hero's welcome by the show's co-host, Paul Ford, who introduced Johnson saying: "One thing I know about Jeremy Johnson—he knows how to spread Christmas cheer!" Johnson then accompanies the men as they visit a local charity, and he even helps to load boxes of donations onto a delivery truck while a jazzy rendition of "Joy to the World" plays. In the mid-2000s, Johnson was a wildly successful Internet entrepreneur, and locals of St. George and Washington County knew him mostly through his impressive philanthropic efforts. As a helicopter pilot, he ferried stranded residents from the wrath of the 2005 Santa Clara river flood that washed away 30 homes. He supported a charity for children fleeing from polygamous communities, and documents in his federal case show he gave more than $1 million to the LDS Little Valley Fifth Ward in St. George. Johnson also made his helicopter and plane available to the Washington County Sheriff's Search & Rescue team to help search for missing hikers or take law enforcement to scout out illegal marijuana grows or search for polygamist compounds in the desert. In addition, he was a big political giver, and perhaps it was his propensity to give so generously to politicians that brought the most scrutiny to Johnson's case. In 2013, he told The Salt Lake Tribune that he'd enlisted former Utah Attorney General John Swallow in a scheme to bribe Sen. Harry Reid, D-Nev., hoping Reid would derail the FTC's investigation into his company. Swallow has long denied the charge, and it's one Swallow will have the chance to fight in court, as both he and another former attorney general, Mark Shurtleff, will face down 19 combined felony corruption charges, several of which are tied to claims made by Jeremy Johnson. Much of Johnson's good works and philanthropy were donated prior to the government's 2011 criminal indictment. "He was a local," says the now-retired Sheriff Kirk Smith. "He was a good kid that had done good, and he had money, and it wasn't a difficult thing for him to donate to a worthy cause," Smith says. "He was a local celebrity almost," Washington County Attorney Brock Belnap says of Johnson's good deeds. He had no idea what Johnson's business was about until the indictments came down. "I didn't personally know him." There were some, however, who claimed to know Johnson's dark side. As early as 2007, Johnson was on the radar of federal investigators after the FBI began investigating an allegation centered on Johnson who, along with several associates, were said to have unlawfully detained—kidnapped, if you will—a man named Wayne Reed Ogden. Ogden, a convicted felon currently serving time in a Colorado prison on fraud charges, claimed Johnson and his associates were upset because they'd lost a half-million dollars investing in a company operated partly by Ogden. According to an FBI report that is part of Ogden's public court file, Ogden says he was blindsided when he walked into a meeting set up by Johnson only to be slammed against a wall by unidentified men, which, he says, knocked him out. When he awoke, he said he was handcuffed and zip-tied to a chair. That's when he learned just how much Johnson and his associates wanted their money back. Had the case been further investigated, had charges been filed and had Johnson been convicted of kidnapping, Johnson might have been behind bars long before the FTC began investigating his company. But Johnson's charitable good deeds meant that the local county attorneys had to take a "hands off" approach to avoid the appearance of impropriety and instead had to search for another agency to handle the investigation. Even the Utah Attorney General's Office had too many conflicts of interest to take on the Johnson investigation because of Johnson's campaign donations and friendship with Shurtleff. So, despite the fact an FBI investigator concluded in 2007 that Ogden had been unlawfully detained, allegedly by Johnson and his associates, no charges were ever filed, and the investigation was finally abandoned in 2010.